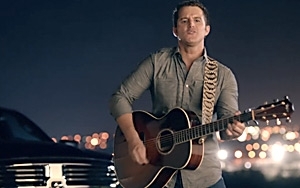 Fiat Chrysler Automobile’s Ram Truck brand is expanding its relationship with country singer Easton Corbin. A new song is key to a Ram truck campaign breaking this week. It includes two 30-second TV spots set to Corbin's music, and a digital campaign around the Ram-inspired song, “Let's Ride.” There is also a music video for the song, on rotation on various digital music channels, which will be on his upcoming album. The campaign, via AOR Doner and Nashville-based G7 Entertainment Marketing, spotlights the virtues of both the Ram 1500 and summer evenings and festivals, in which the Ram plays a narrative role. The ads are airing through August, according to Ram. The truck brand and celebrity have worked together since Corbin was one of the up-and-coming country artists to be part of Ram's first “Road to the Ram Jam” program in 2012. That was a year-long promotional campaign featuring four other country artists who raided money for charity and got to drive the Ram for a year. In 2013, Corbin was involved in the brand's “Year of the Farmer” program, as he was a former member of Future Farmers of America. The official music video for Corbin’s song launched on Friday on Yahoo Music and on VEVO, YouTube, Yahoo Ram Country and other digital services this past weekend. It's also at a dedicated Vevo music streaming site. Corbin is under the Mercury Nashville label. "We continue to look for unique ways to creatively show how Ram trucks are an integral part of our culture and the everyday lives of our customers," said Olivier Francois, chief marketing officer, FCA-global, in a statement. Ram and Corbin also collaborated on an upcoming “behind-the-scenes” video, which will be posted on their respective social media sites in August, per FCA. The song will also be the title track on a new album to be released at the end of the month. The ads and music video are about a cultural touchpoint for rural America: the county fair. The first ad tells the story of a young couple who take their Ram pickup for an evening of fireworks and the fair. The spot touts the Ram 1500's 29-mpg highway fuel economy and infotainment option (the 8.4-in touchscreen set to SiriusXM's), which happens to be The Highway channel, which is playing “Let's Ride.” The other spot touts the Ram 1500 towing, torque, payload and fuel economy. In this case it shows the carnies rolling up to the fairgrounds in a Ram towing trailers carrying the rides.